Erik Weihenmayer is well-known around the world for being the first blind person to reach the summit of Mount Everest, complete the 7 summits and many other amazing accomplishments. 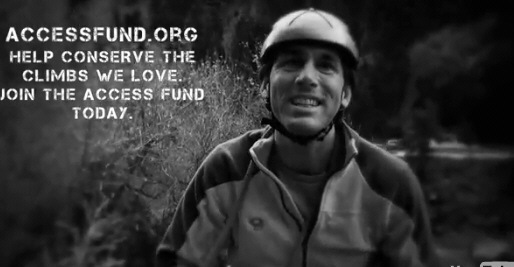 Weihenmayer’s actions obviously inspire a lot of people, so with that in mind he teamed up with the Access Fund last month to hopefully inspire more climbers to become members. If you’re not already a member of the Access Fund, be sure to check out their website to see how you can help. Of particular note is the newly introduced Access Fund Visa® Platinum Rewards Card that automatically contributes to the Access Fund as you use it. Very inspiring. I love how Eric lead the last pitch. Insane!! If you don’t join the access fund, you hate blind people. But seriously… amazing, inspiring, motivating. It blew my mind! Leave a Reply to Mark Click here to cancel reply.